By Maya Kesh — Since Lois Lane first debuted in 1938’s Action Comics #1, right alongside Superman and Clark Kent, she has been a lightning rod for how society views strong women. Through the years, this significance has been a double-edged sword, with Lois’ characterization reflecting both progress and limitations in various eras. As the Superman comics pass to a new writer this summer amid much media coverage and fanfare, I think it’s important to look at how Lois has been written historically, what it means to write her well, and why her depiction is so important for Superman stories. In the early Golden Age comics (1938 - 1955), we see Lois Lane very much steeped in the working dame mode of that era. This is familiar to us through old movies like His Girl Friday. In the Silver Age (1956 - 1970), Lois becomes a caricature of this idea, a desperate career woman who needs to marry to be happy. Lois having an end goal of marriage isn’t a problem, but it is a problem how that end goal is defined, as if when she marries Superman, she will have achieved the sum of all her ambitions. Marriage basically became an obsessive goal, one that wasn’t portrayed sympathetically at all. Next came the Bronze Age (1970 - 1985) and the women’s liberation movement. During this time, Lois was seen through those changing progressive attitudes. Groovy, right? I am woman hear me roar. She was navigating slowly-evolving attitudes toward women in those years. In the Modern Age, we’ve come to another turning point for Lois. She’s currently married to Clark, and they have a son, Jon. There has been a lot of discussion lately about what this means for Lois Lane, and it often comes back to this idea that being married to Clark and raising a child somehow limits her character. This begs a question: Why? I think it goes back to the Silver Age idea that marriage is somehow an end for her. If she’s married, she can’t be everything she could be. That notion, however, brings us to another question: Are husbands and dads primarily defined by those roles, too? Or, are they written as multifaceted complex characters who are able to be many things to many people? The answer to the second question is decidedly yes. They can be career men (which isn’t even something men are called), as well as husbands and fathers. 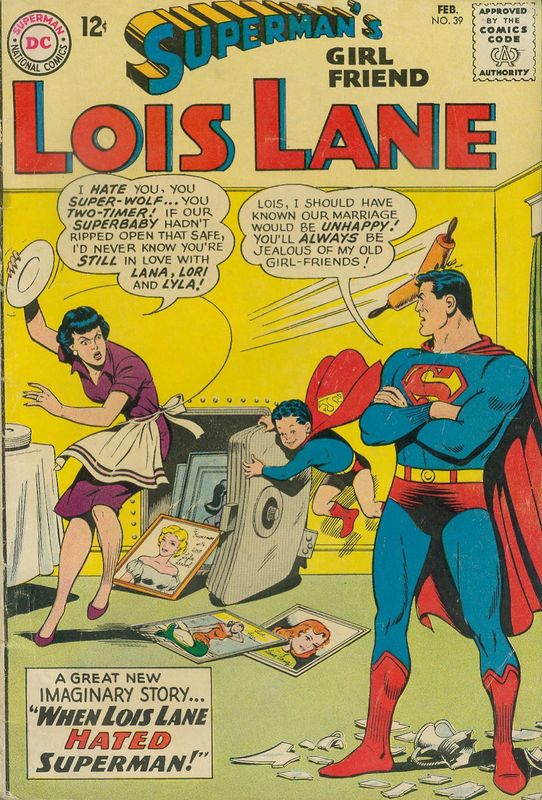 Women, however, are still often defined by stereotypes within labels, as if Lois Lane being a career woman means that she can’t also be a mother and a wife. When Lois is written as a mom, for example, there is this idealized version of who mom is. 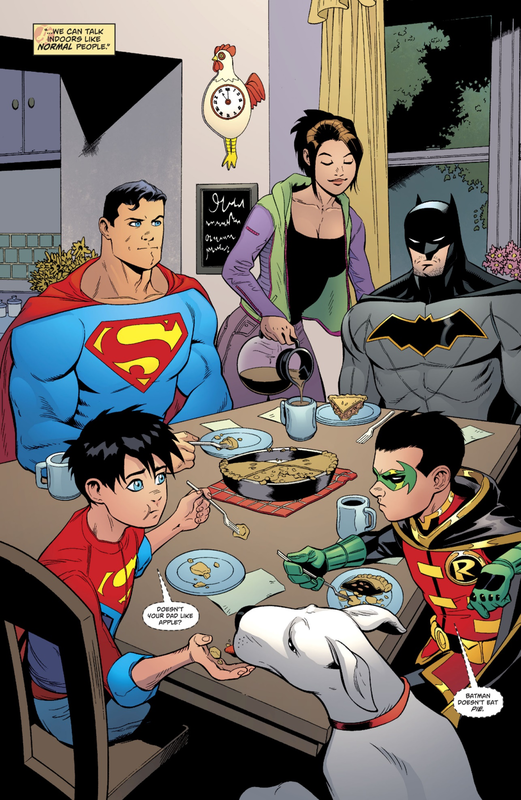 And usually in the Superman-verse, this means Martha Kent, the stay-at-home mom who kept house and baked pies. Trying to fit Lois into that mold means writing her in an inorganic way that belies her personality. One’s personality doesn’t change after you have kids—my own teenagers can attest to that. Do priorities change, though? Of course. Being a mother, however, shouldn’t turn Lois into Martha Kent. They’re entirely different people, and Lois doesn’t have the same skillset Martha does, nor does she need it to be a good mother. 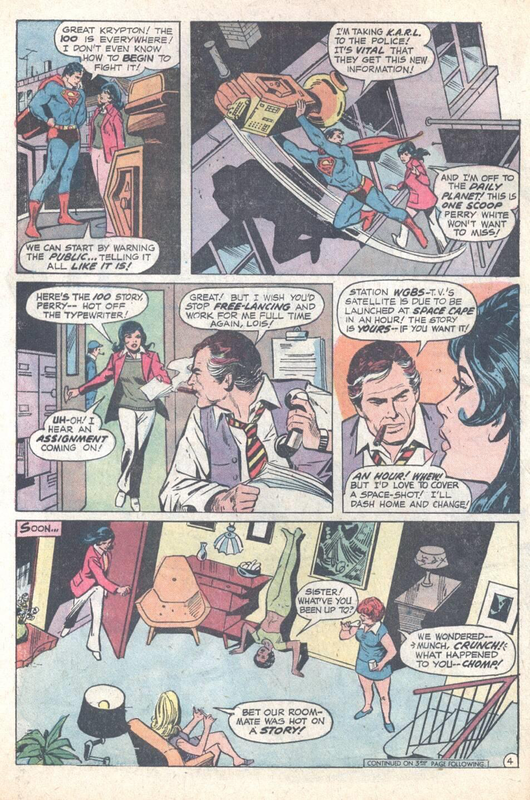 Basically, Lois might not be able to bake a perfect pie (although Clark probably can because he grew up with Martha as his mother), but she may be better-able to show her son how to pick a lock or hotwire a car if he ever loses his keys. This doesn’t make Lois any less of a mom. The definition of mother/wife should broaden to include all types of people. Just as dads are not inept stereotypes, neither are moms an idealized throwback to Leave it to Beaver. In general, I think Lois often suffers from baggage writers bring when they think of her character throughout history. Some remember her as the abrasive pest she sometimes devolved into in the Silver Age, never mind that Superman was just as culpable at that time (so much so a site was dedicated to his Superdickery). Some seem to remember her as a man-hungry husband hunter, or as somebody who only loves Clark’s powers (I’d argue she always loved the man behind the disguise, no matter which persona that was). It sounds simple, but I think this bears emphasizing: to write Lois Lane, it is important to know who she is and the traits that have long defined her. Lois is strong, tenacious, compassionate, and ethical. She also wears her own masks. She’s vulnerable but doesn’t want the world to see it. Lois is fiercely dedicated to truth and justice, using journalism as her own superpower. She also understands there are shades of gray. Truth isn’t binary. There are some truths worth protecting from the public. Clark’s identity, for example, isn’t for public consumption, as it doesn’t have any bearing on public welfare. There are, however, lies that exist to destroy people (ahem, most of what Lex Luthor does), and she is out to expose people who hurt others as they quest for power. There are recent examples of Lois being written this way. This scene from Mark Waid’s Birthright shows us a Lois who stands up for injustice no matter where she sees it. And this scene from Kurt Busiek’s Action Comics #850 shows us Lois’s early days with Clark. It’s a great example of how to write the triangle for two while giving empathy to both players, rather than turning Lois into an unsympathetic person only interested in Superman and his powers. These are just two examples. Teenage Lois in Gwenda Bond’s young adult Lois Lane prose trilogy also gives us a multifaceted portrayal. In live action, for all of Smallville’s ups and downs, the TV show ultimately captures Lois’s complexity pretty well. In the end, I think it’s important to remember Lois Lane was originally created alongside Clark Kent and Superman for a reason: she provides the audience with a narrative bridge between his identities. Through Lois, we as readers see the wonder that is Superman, while we also see the everyday life of Clark Kent—a dichotomy filtered through one character to create a consistent perspective. This all speaks to why I believe it is so important for Lois to be written well, because it is through her that we gain access to all that is Superman. When Lois is allowed to reach her potential? Superman stories truly soar. Maya Kesh is a lifetime comic reader and a writer whose articles often focus on how women are portrayed in comics. You can follow her on Twitter at @mayak46.